I have three canaries but one is my friend more than others. 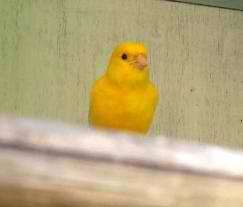 One day I offered my canary to come out from the cage but he did not come. Then I placed water in a plate on the table so that when canary will see, it will tempt him to take bath but did not work. Next I added canary seed too in another plate near to water one. It seams little work started but still canary does not want to come out. It seems the reason was small piece of apple in his cage so I removed that and placed with the seed plate. Then Wow the show started! First canary came out of the cage and made noise and then started eating from the seed plate and then apple and then at the end took bath with his beak. I enjoyed all this brave show and at the end canary does not want to go back to his cage and hide behind curtain and started staring at me so that I pick him up and returned to his cage. what a great blog you have made for us and we also appreciate you and keep update and posting so your blog can get more visitor. Thank you man like it. Have you attempted splash millet to bait the canary into the new pen? That has a decent risk of working. You can utilize any treat your canary likes to eat. australianessay.com | essay writing. Canaries can be difficult to get (simply like finches) so now and again you should be a bit innovative.